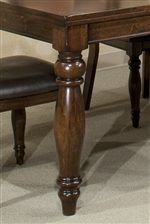 Make a functional and fashionable addition to your dining room with this serving table. 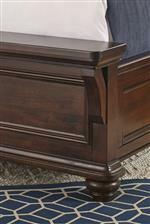 The piece carries a medium brown finish with distinct distressing and features short, turned legs. 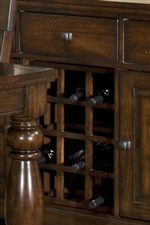 Plus, the three drawers, two doors and wine rack are wonderful for keeping silverware, dishes, tablecloths, glasses and wine bottles. There will be a lot to like with this wine server in your dining room or kitchen. The Caprice 58" Wine Server at Walker's Furniture in the Spokane, Kennewick, Tri-Cities, Wenatchee, Coeur D’Alene, Yakima, Walla Walla, Umatilla, Moses Lake area. Product availability may vary. Contact us for the most current availability on this product. You'll be ready for almost any hosting situation with help from this Caprice collection. 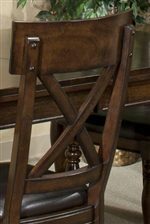 The leg table carries a rich, raisin finish and features sturdy turned legs and plenty of space to gather with family and friends. Plus, the matching chairs include a X-back design as well as an upholstered seat and turned front legs. 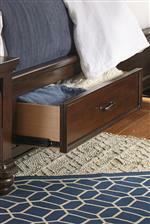 Keep your home decor simple, warm and inviting with the addition of the Caprice collection. The Caprice collection is a great option if you are looking for Transitional furniture in the Spokane, Kennewick, Tri-Cities, Wenatchee, Coeur D’Alene, Yakima, Walla Walla, Umatilla, Moses Lake area. Browse other items in the Caprice collection from Walker's Furniture in the Spokane, Kennewick, Tri-Cities, Wenatchee, Coeur D’Alene, Yakima, Walla Walla, Umatilla, Moses Lake area.